Those that have broken new ground in sustainable bonds say they have been vindicated by the “unstoppable” movement, while issuance has catalysed internal change as well as attracting new investors. And hopes for the future are high. 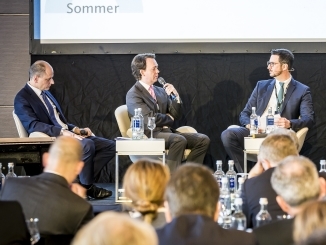 Tom Revell reports from LBBW’s European Covered Bond Forum in Mainz on 1 March. 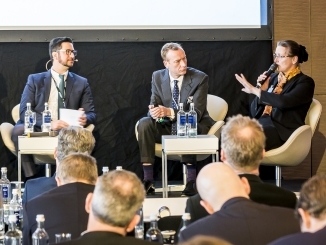 “When we first started talking about sustainability in 2011, some people in our bank would say, ‘oh, it is just a trend, forget about it’,” says Claudia Bärdges-Koch, of Münchener Hypothekenbank. MünchenerHyp was the first issuer of a sustainable covered bond, printing a EUR300m five year ESG Pfandbrief in September 2014. The deal, which refinanced cooperative housing loans, has been followed by social and green covered bonds of various formats from an increasing cast of issuers. Bärdges-Koch, deputy head of treasury at Münchener Hypothekenbank, says the market has developed “greatly” since the German issuer’s debut. “You can’t circumvent this market anymore,” she says. Bärdges-Koch (pictured below) says that landmark deal arose because MünchenerHyp, surveying its existing cover pool, saw potential for the transaction based on the volume of sustainable assets already included. “We did not go purely for green, because social was for us also a very important aspect,” she says. MünchenerHyp identified cooperative housing loans as collateral within its existing cover pool that met criteria defined by oekom and committed to maintaining an amount of such loans in its cover pool sufficient to cover the EUR300m issue. This process of flagging assets was a difficult one, she says, and the bank has not issued a further ESG covered bond since because it has been developing its internal systems. 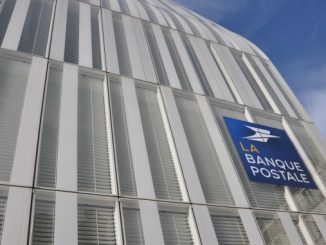 In November 2015, the bank introduced a new green retail loan designed to be eligible collateral for green Pfandbriefe, and followed this with a family loan, “concentrated on the social aspect”. “This is because we faced the accusation, from just a handful of investors, that what we had done in the past was some kind of green-washing, just seeing what kind of loans would fit in,” she says. “We are now investing in the future by reducing the interest rates on these two new types of loan. 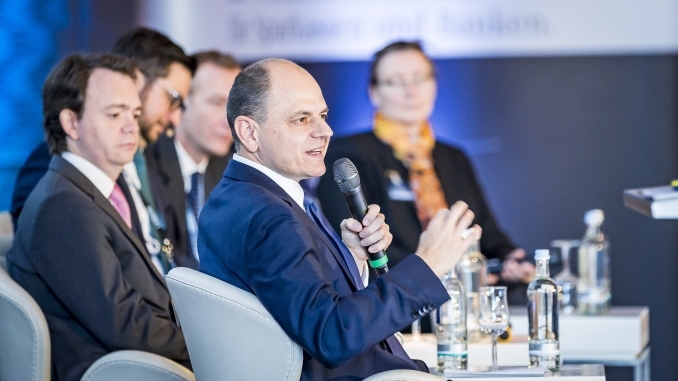 Bärdges-Koch notes that today, one in every 10 of MünchenerHyp’s mortgage loans is a sustainable loan, a process that required convincing people not just within the issuer but within the Volksbanken and Raiffeisenbanken that procure mortgage loans on its behalf. Social covered bond issuance was a natural move for Kommunalkredit Austria, which in July 2017 issued a EUR300m four year social covered bond – the first in the asset class to be backed by public sector assets. The deal was Kommunalkredit’s first publicly-issued covered bond since 2014, with the issuer having been split into a going concern entity and a bad bank in autumn 2015. “Kommunalkredit was established in 1958 and it has understood itself always as a financer of sustainability projects — of social infrastructure projects, such as hospitals and kindergartens, as well as renewable energy,” says Georg Lehmann, senior manager, investor relations at Kommunalkredit Austria (pictured below). “As part of our general business model we wanted, with our first covered bond since privatisation, to come to the market with either a green covered bond or a social covered bond. In its existing portfolio, the Austrian issuer flagged some EUR400m of eligible assets for the debut transaction. The deal was issued under a social covered bond framework developed by Kommunalkredit, with a commitment to use the proceeds of the bond to finance existing or new social infrastructure projects, focusing on education, healthcare and social housing. Most of Kommunalkredit Austria’s future covered bond issuance is expected to be social or green-oriented. 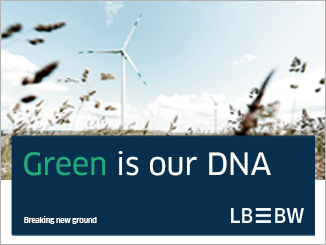 In December, LBBW inaugurated a new green funding programme with a EUR750m four year senior unsecured bond, issued against a portfolio of EUR2.9bn eligible commercial real estate loans. The deal was at the time the largest green bond from a European bank. 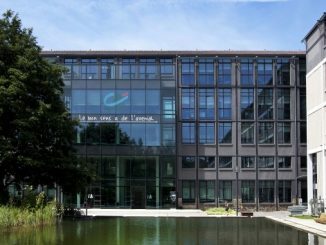 LBBW can also issue Pfandbriefe from the programme, and is expected to issue benchmarks in both formats over the coming years. Speaking on the panel, Frank Damerow, director, sustainable finance and strategy at LBBW, says the deal “was just a start” for the issuer. See here for more on LBBW’s programme. The issuers each cite the challenges involved in preparing a social or green covered bond for the market, and note that as of yet there is no sign of a substantial discernible reward in terms of primary market pricing for their efforts. “We haven’t seen a difference in pricing yet, and in fact, a green or social bond comes at some cost,” says Lehmann. “You have to do your homework, and you have to implement many layers in your organisation to evaluate and assess the environmental and social impact, for cash in and cash out. Bärdges-Koch agrees, suggesting that additional oversubscription owing to a deal’s green or social nature could yield a saving of an extra 1bp or 2bp during the execution process, “but that’s it”. Florian Sommer, senior strategist, head of sustainability research, Union Investment (speaking in main photo), was more enthusiastic in this regard. “As investors, we are currently in the lucky position that for the green or social benefit, on the primary market at least, we don’t have to pay for it,” he says. “That is probably one reason these securities are very much oversubscribed. Sommer adds that this could change in the future, should the pool of “sticky green bond money” continue to grow with the development of more dedicated funds. “I can see that could also have an effect on pricing,” he says. In the meantime, the issuers highlight other, significant benefits. Lehmann says regular sustainable bond issuers can access a “tremendously” different investor base. 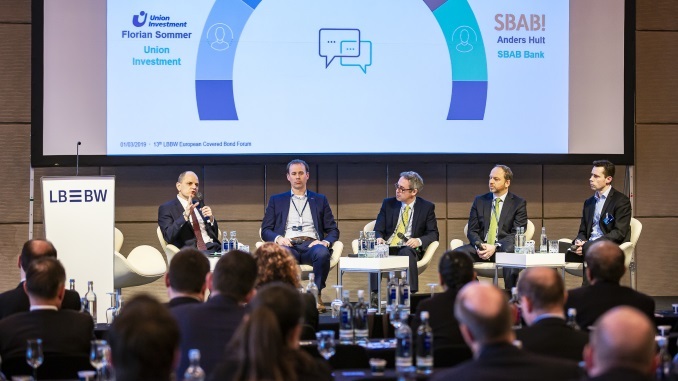 Around half of Kommunalkredit’s deal was allocated to dedicated sustainable investors, while some 32% of MünchenerHyp’s ESG debut and 31% of LBBW’s green debut went to such accounts. These early successes have also prompted changes within the issuing institutions. “I think we all agree that doing a green bond sharpens your attention to institutional challenges you might have in the interaction process across departments from treasury, sustainability and risk management into the market side,” says Damerow. “It is a steep, steep learning curve for everybody, which you will have to replicate over various business lines, but it also gives you clarity around climate risks, for example. Bärdges-Koch says MünchenerHyp’s deal triggered a “mind change” within the bank. “I think some people were surprised by the success of the issuance, and then we said, ‘look, this is not the way it has to be’,” she says. “Now we have sustainability management and a sustainable cycle within the bank, which helps us because it provides many more cover pool assets that can easily be flagged. Indeed, the discussion makes clear that sustainable investors take some convincing – as intimated by the earlier revelation that MünchenerHyp, despite being the pioneer of the sustainable covered bond market, had been accused by some of green-washing. Sommer says Union Investment has kept ESG information on issuers for many years — noting that sustainable investment predates the green bond market — and that an analysis of a green bond issuer’s risks, including climate risks, is an important part of their analysis. Discussions are also ongoing on how ESG factors can be incorporated into credit rating agency’s assessments of financial institutions’ ratings, Sommer notes, suggesting that “things are moving in the right direction” and that their inclusion will become more normal. “How do we measure the green value or social value of a bond itself?” he adds. “We seek from issuers good information and good transparency – what is the green impact or social impact of the assets that are being financed. 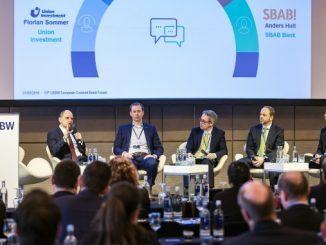 The European Commission’s action plan, designed to lay the foundations for sustainable and green finance to reach their potential, has been a key talking point for the market. The plan will be informed by recommendations put forward by a High-Level Expert Group on Sustainable Finance (HLEG) in January. Damerow (pictured below) notes that the HLEG has been “very precise”, and says the Commission is taking its input very seriously and is looking at an accelerated implementation of supportive measures. “They are asking, for example, very concretely to look at mitigation measures, along with a defined taxonomy, by mid-2018, so that puts a lot of pressure on a large variety of market participants to look at the subject of sustainable finance,” he says. “That is also flagged by broader measures to essentially introduce a labelled green bond market segment within the European Union. The other panel participants are also optimistic that any measures that emerge will be supportive. Lehmann highlights proposals such as lower risk weights to support green and social investments or the definition of a Climate Covered Bond — which could be backed by loans for infrastructure projects with a positive climate impact that are not yet eligible collateral for cover pools — as being potentially supportive. Sommer, too, is “relaxed” about the HLEG proposals, hoping that measures will spur a growth in the pool of sustainable assets available for investment, highlighting the potential of legislation to provide incentives for issuance and clarity on definitions and standards — strengthening standards set by the Green and Social Bond Principles. The market’s increasing growth will also continue to be driven by strong demand for green and social products, both from investors and retail customers, the issuers add. “So far, there has obviously been a phenomenal growth rate in green bonds, but the base level is still very small, smaller than 1% of global debt capital markets,” says Damerow. 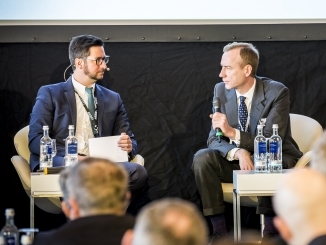 “You see more and more issuers come to the market, and of course, it’s a topic that is also increasingly discussed now at the sovereign and sub-sovereign levels.